Rethinking Social Justice and the Public Realm: What can Relational Approaches Offer? We are calling for abstracts for an exciting two day workshop on Thursday 1st and Friday 2nd of November at The University of Manchester. The aim is that the workshop will result in organising a special issue of a leading journal. The ‘relational turn’ has become increasingly influential within efforts to theorise social justice and the types of progressive public action required to challenge injustice. This has included moves to re-understand justice, the state, egalitarianism, and poverty, and to promote alternative approaches within public policy debates in both the global north and south. Part of a broader shift within the social sciences, relational approaches have the potential to be highly significant, moving beyond resourcist or institutionalist accounts to investigate the social relations that may underpin particular resource distributions or institutional configurations, and which amount to forms of social injustice in themselves. Influential contributions of this type have been made concerning, for instance, social justice and egalitarianism (Young 1990; Fraser 1995, 2009; Anderson 1999; Schemmel 2012; Wolff 2015), the state (Jessop 2007; Cottam 2011; Cooke and Muir 2012), and poverty and underdevelopment (Hickey and du Toit 2007; Mosse 2010; Elwood, Lawson, and Sheppard 2017). This and other work suggests the possibility of an exciting shared agenda bridging a number of related fields. What these diverse contributions converge upon is a sense that social relations – for instance of power, identity, socio-economic class, recognition, and between citizen and state – are key to understanding problems of social injustice, inequality, poverty, and state performance. This contrasts with views that assume that such problems can be understood entirely in terms of the distribution of goods, or that poverty and deprivation are isolated phenomena caused simply by the relevant populations being residual to or excluded from otherwise benign processes of development. 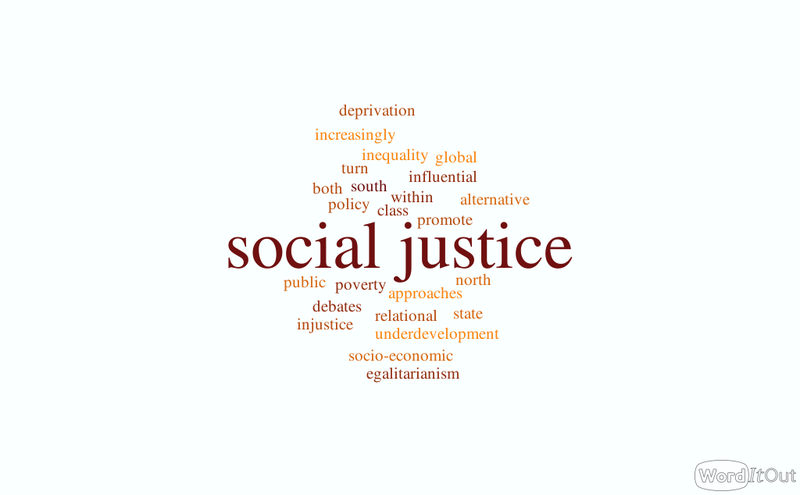 Meanwhile, the idea of social justice seems to be moving into the discourse of global policy actors (World Bank 2017; United Nations 2017), as well as gaining prominence across international media with ever-more astonishing accounts of wealth inequality, and with globally attention-grabbing movements such as the ‘Black Lives Matter’ and ‘#MeToo’ anti-racism and -sexism campaigns. Activists and academics alike have sought in their pursuit of social justice to reimagine and reclaim the ‘public realm’, a space undermined not only by successive waves of neoliberalism and austerity, but also the aggressive resurfacing of old inequality-generating ideas and discourses around ethnic origins and gender. This suggests that the current moment is opportune for research contributions that can inform a critical and sophisticated understanding of social justice. The workshop, over two days, is aimed at critically exploring what a relational approach can do to advance scholarly debates and progressive public action with regards to social justice and the public realm, with the latter conceived as encompassing, for instance, the state, the ‘public sphere’, and civil society, without foreclosing the possibility of questioning the implicit public/private divide itself. The workshop will bring together a diverse mix of scholars, and will feature paper presentations and discussion on these themes. Abstracts are welcome from those working within a variety of discipline areas, including political philosophy/theory, public policy, sociology, and development studies. There is an explicit intention to submit a proposal for a special issue to a leading journal. The underlying theme will be the question of what a relational approach brings to these topics, and, indeed, what the defining features of such an approach actually are, or should be. This latter question is important given that within existing relational accounts it is possible to perceive something of a divergence between approaches that are ‘relational’ in the sense of arguably focussing primarily on the nature or quality of interpersonal relations (e.g. Anderson 2009; Cooke and Muir 2012), and others whose relationality is more ontological, looking to structural relations between social groups (e.g. Jessop 2007; Young 2013). Others, meanwhile, have argued that relational approaches overplay the opposition with distributive accounts of social justice and argue for hybrid accounts that bring together relational and distributive notions of egalitarianism (Moles and Parr 2018).